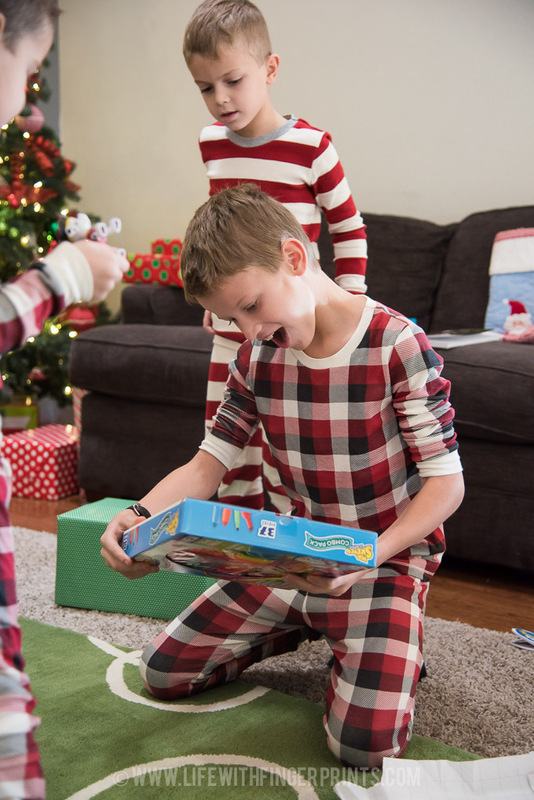 Christmas morning in all its matching pajama glory!! I’m not sure what time the kids actually got up, but we heard them about 7:15 walking loudly upstairs (they had strict instructions not to come down until we came to get them) so jumping around was their best way of waking us up. 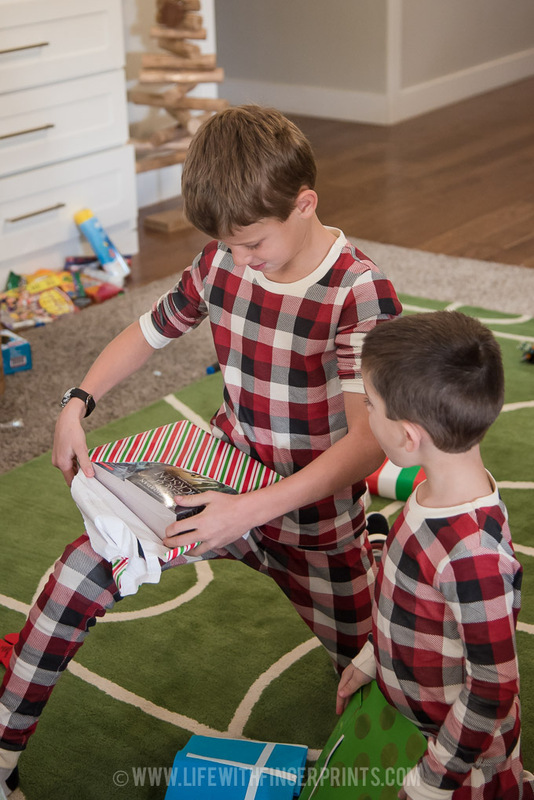 The only thing on Christmas morning that comes from Santa is their stocking, which they came down and opened immediately. 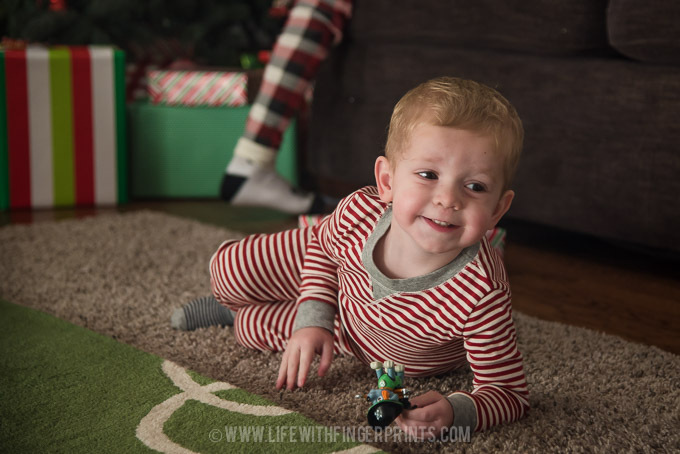 They were entertained for a little bit until they were ready to move on to presents. 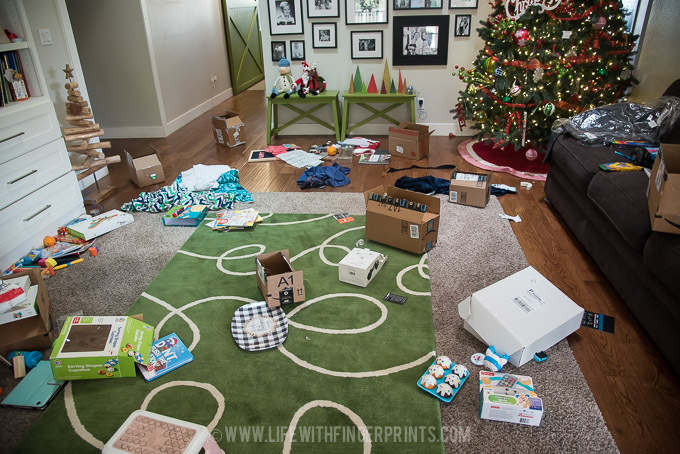 Our present opening is a little crazy – but not chaotic. 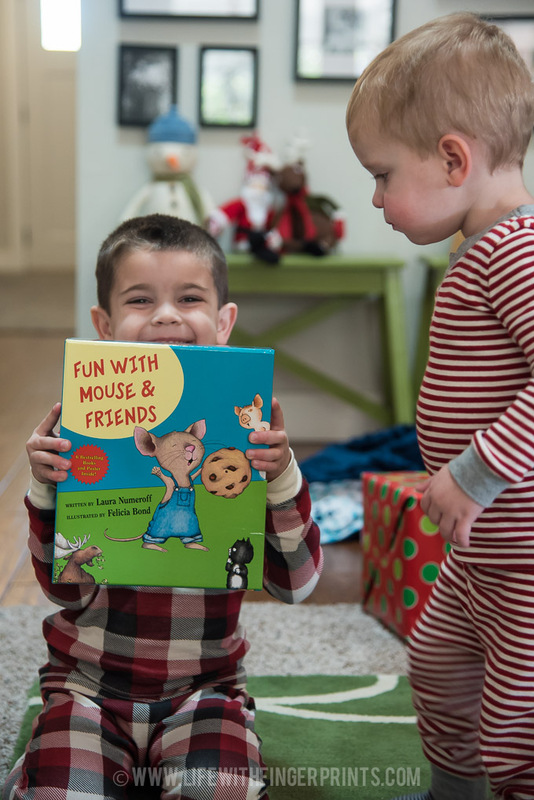 We open gifts one at a time, usually starting with the younger ones and working our way up. (Aside from Briggs, I make sure there is the same number of gifts, although the value may greatly differ). 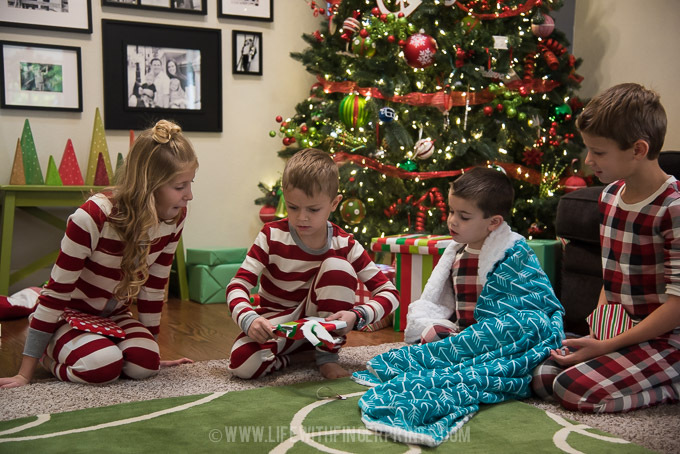 They each grab gifts from under the tree and wait until they get the okay that it’s their turn. 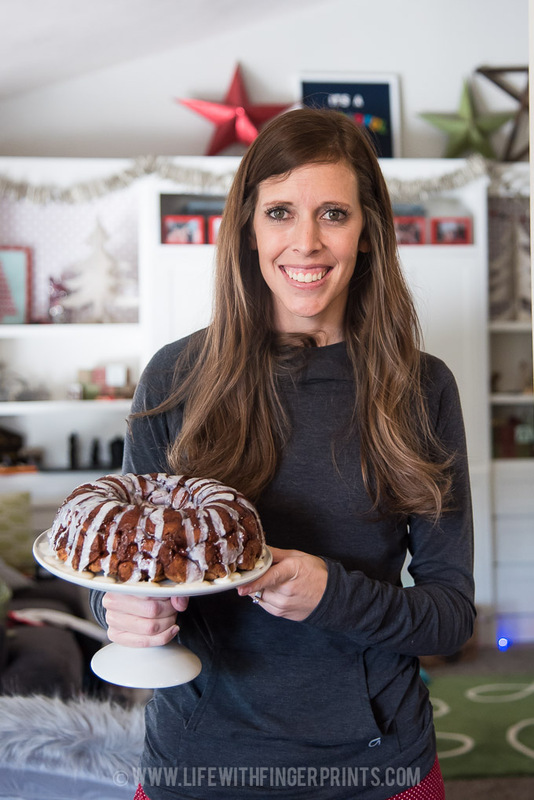 This year after the kids had opened two presents, we let them play while we got breakfast in the oven – sausage egg casserole prepped the night before and our traditional monkey bread. 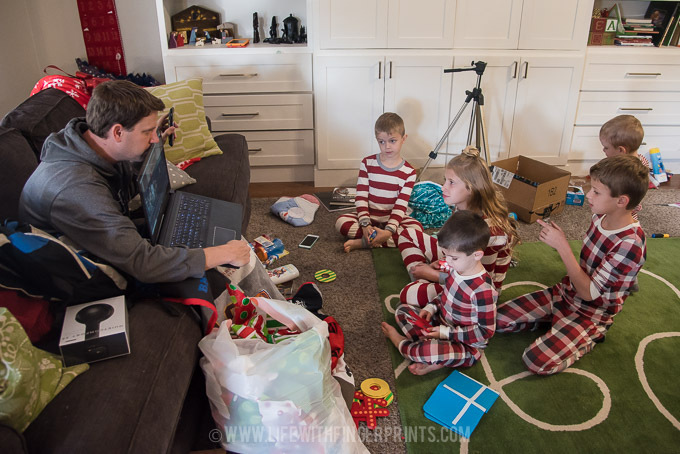 By the time we made it back to the living room my parents were on Skype and the kids opened their present from them. That Skype call was interrupted by Steve’s parents calling from Africa – with the time change and unpredictable internet we were glad to get a chance to see them on the computer. The kids were not aware of this – but the money Steve’s parents would of spent on Christmas for the family this year (and also our gift to them), was actually donated to provide scholarships for a couple kids to attend school in Ghana. Steve’s parents explained this to our kids and told a story of how they came to know these kids while serving there. They are truly an example of service and love. By the time we got done with the Skype call our breakfast was just coming out of the oven so we assembled back in the kitchen to fill some bellies. 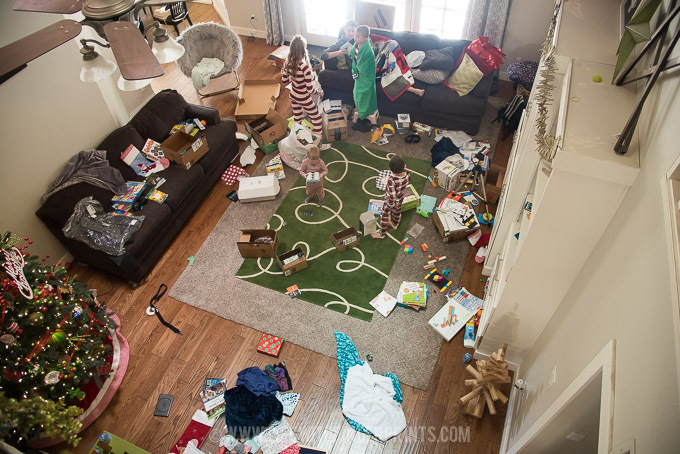 By the time we made it back to the presents, it was after 10:30 and there wasn’t a single complaint. 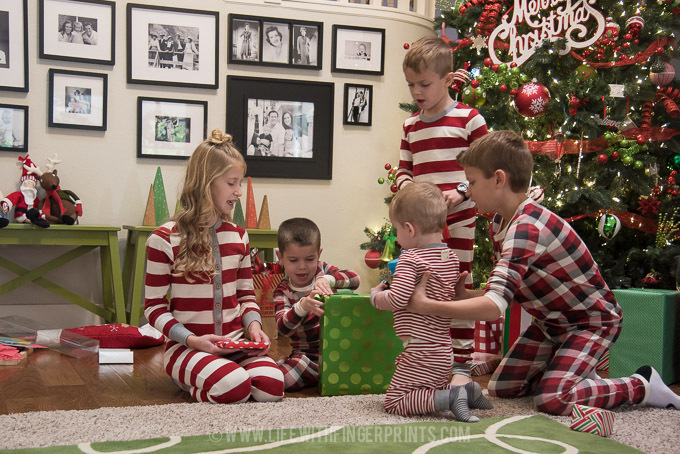 In fact, Hallie mentioned that she loved we were spreading our Christmas presents out over a longer period of time. We had no where to go so we enjoyed the moments. 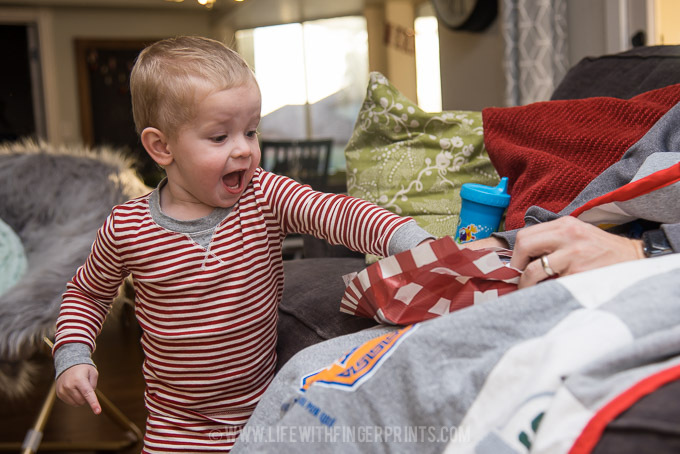 Hallie was a little jealous of Cannon’s new blanket and she looked at me and said, “Are you sure you wrapped that in the right paper.” (We wrap all the kids presents in a single wrapping paper – it’s not until Christmas morning they learn what wrapping paper is theirs!) 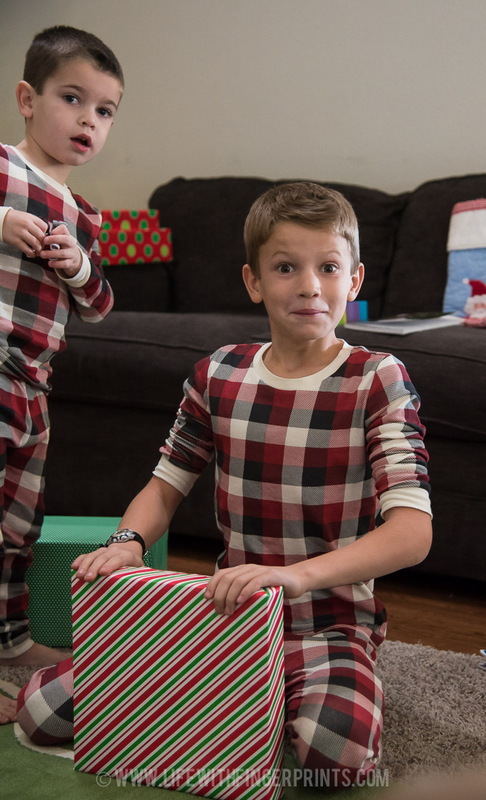 Hunter also had a are-you-sure-you-wrapped-that-in-the-right-paper moment when he saw Bennett opening a watch which is exactly what he had asked for. He looked a little sheepish when he found a similar small box under the tree with a watch just his size! 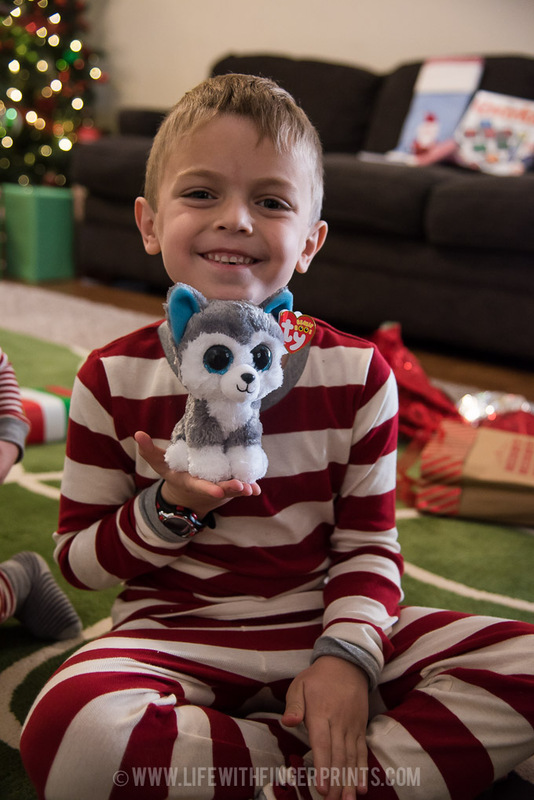 Perhaps Bennett’s most favorite gift from Christmas – a wolf Beanie Boo that he was so excited about when he opened it he rolled all around the carpet squealing with delight. Who knew $5 could buy such happiness! Or the excitement of a box of Mr. Sketch smelly markers. He made a new lego box to take them to school and put them on his desk! Our boys are to the stage that they had very similar gifts this year. I knew getting something for one of them and not the other was not going end well. They both got a watch, Mr. Sketch markers and these cool little robots. 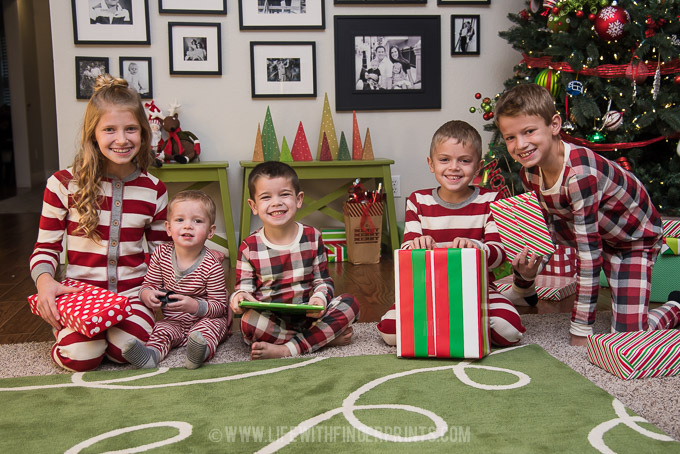 They were the hit Christmas day as they raced them around the house and Hunter started coding his. They really are cool and I did so much research on code-able robots – I’ve got you covered if you have any questions. If you’re wondering – these were one of the very, very few that can work with a kindle as opposed to an apple or android device. I would say in no time it was over – but that wasn’t the case. This mess was created over the course of several hours and it was so much fun. 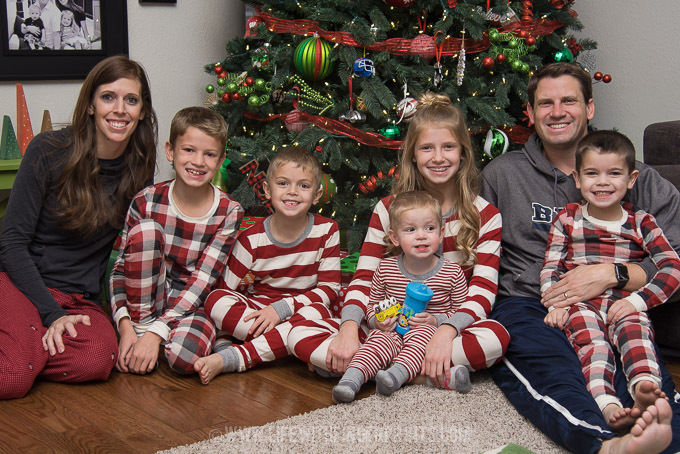 No crying or pouting and I know our kids are young so the bar is low – but we nailed it!! I love that they’re all so easy to please. I’m not looking forward to the teenage years when their expectations exceed budgets! 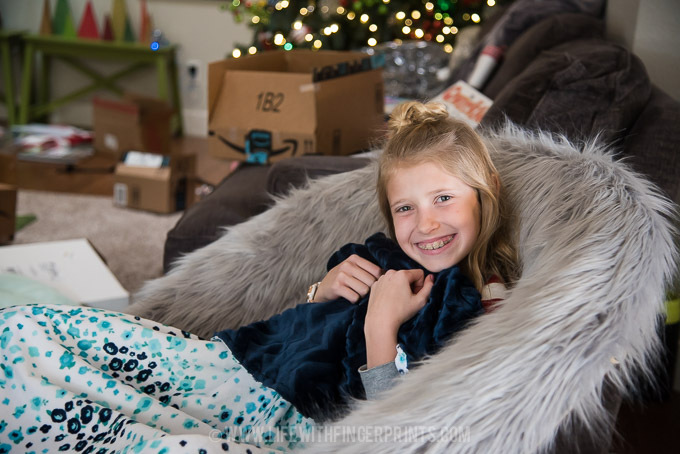 And yes – Hallie ended up with her own super soft and snuggly blanket so she didn’t have to steal Cannons! 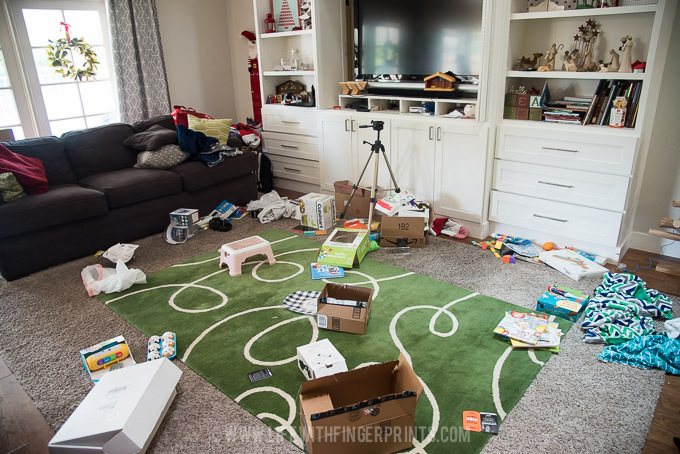 This picture kills me – first of all he got that lego set done while we were prepping for breakfast and eating breakfast. Secondly, he doesn’t typically wear his hat backwards but for some reason he looks so old when he wears it like this! 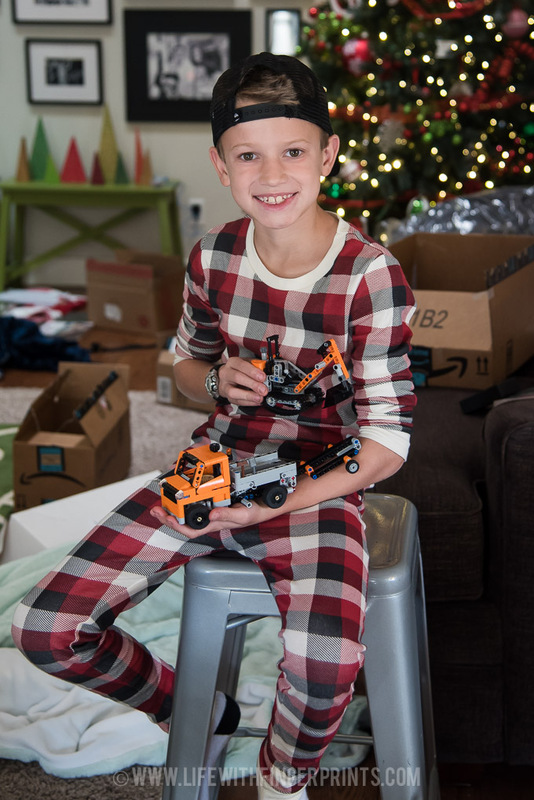 Every year I give him another Lego set I wonder – is this the last year he’s going to be interested Legos. Not the case this year! I like how Santa just does the stockings. 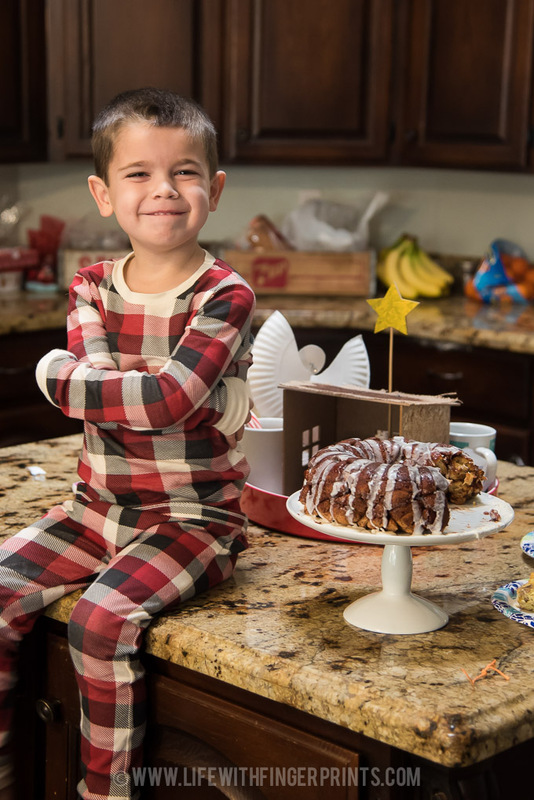 Makes things less confusing that morning and leaves more room in the Santa sack for other kids. Neither Steve or I had generous Santa’s growing up – our kid’s stockings reflect our own childhood. It has some needs (toothbrush, socks, underwear), candy and something fun but fairly insignificant. It works for us!